Texas Criminal Defense | Goheen & O’Toole, P.L.L.C. At Goheen & O’Toole, P.L.L.C. we realize the defense of those charged with violating the law can be challenging, but we accept that challenge and promise to live up to it day in and day out. Criminal law in Texas is a constantly evolving practice whether you are charged in Collin, Dallas, Denton, or anywhere else in North Texas. This means you need a criminal defense attorney who stays abreast of the latest updates in the law as well as the trends in trial strategy and practice. Our belief is that criminal law does not just involve the process in the criminal law courts. Rather, it extends into helping the whole person by assisting in collateral issues related to the criminal law charge — from mental health and addiction to fighting for your driver’s license or expunging a record. When dealing with a criminal law issue, many times it is easy to take the easy way out by quickly accepting any resolution offered by the prosecutor. At Goheen & O’Toole, P.L.L.C., however, we focus on the long-term impact such a move could have on your life. Whether it is negotiating with the prosecutor for a better offer or arguing your case in court, you do not want to walk this path alone. Our attorneys can help you determine how the plea bargain conveyed by the prosecutor will affect your long-term plans and goals. If necessary, we can recommend services to you such as rehabilitation facilities, counselors, and programs providing you with a stronger negotiating position with the prosecutor. If, after consulting with us about your case, we recommend you fight the case in court, you can rest assured you are in good hands with any of our trial attorneys. With over 50 years of combined experience focusing on criminal law and over 450 trials, you can feel confident that we will be prepared to fight for your rights in court. Since more than one of our attorneys are former prosecutors, we know how the other side will be preparing for your case. Don’t you want that type of preparation on your side? Goheen & O’Toole, P.L.L.C. has handled cases ranging from simple Class C Misdemeanor assaults to complex white collar crime cases. 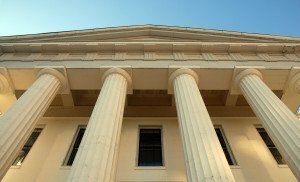 We have argued cases in municipal courts, county courts, and district courts; and we prepared to take your case and apply our criminal law experience to help you. Between our attorneys, you'll be able to find representation whether your case takes place in one of Texas's many state courts or the United States Supreme Court. If you are charged in Collin, Dallas, Denton, or anywhere else in North Texas, contact Goheen & O’Toole, P.L.L.C. today for a free consultation about your rights.